No, it’s not safe to drive on the roads—not in this condition. And it would take a lot to get it there. But what if you lived in a world without such strict rules? 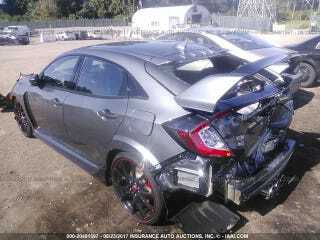 If so, that 2017 Honda Civic Type R, destroyed this summer by a jackass driver who wasn’t paying attention, could be your next salvage race car. You may remember Jalopnik reader Greg, who flew to Boston from Philadelphia to buy the new Civic Type R, only to have it destroyed by an inattentive driver on Interstate 95 mere hours later with a mere 164 miles on the odometer. Soon, that car will be up for auction, and if you want it, it can be yours. No price is listed yet, but go here to check it out. Honey, that is the least of your problems. If you want some good news, Greg told Jalopnik that his insurance finally agreed to total out the car, so he’ll be getting paid out for the purchase he had oh-so-briefly. Before, Greg was worried he’d somehow still be on the hook for part of it; luckily, that isn’t the case. Today I got to see the car torn down and a got a better look at the damage underneath. The impact went right over the front and rear crash beams. The unibody itself took all the damage in the rear and the AC condenser and radiator were pushed into the turbo. The damage to the engine was enough to total the car. If I would have been hit and pushed into cars instead of tall SUVs the damage would have been absorbed by the crash beams and maybe would have been able to save the car. Then again that might have set off the airbags too. Either way, the accident itself and the outcome have been for the best. At the very least, nobody was hurt, and Greg says he hopes to be back in a Civic Type R soon. In the meantime: with a bunch of work, you may just be able to pull a Robb Holland and turn this into a great salvage title race car project. You can re-bend a frame and fix the motor and turbo. We think it could be done. If we’re wrong here, tell me.